Help Support - Improve - Expand Mystagogy! Big Announcement Today! A New Day Dawns! 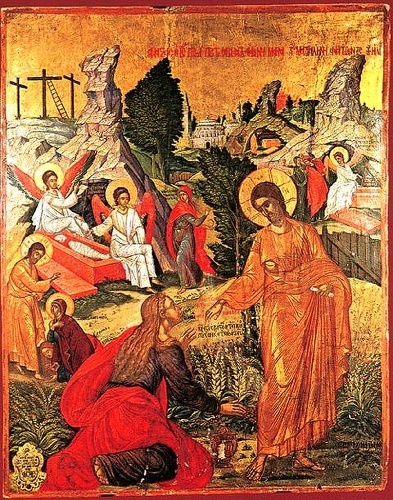 "Greek Easter" or the Lord's Pascha? How Did the "Life-Giving Spring" Get Its Name? Bunnies and Chicks or Cross and Resurrection? Who Wrote the Lamentations of Holy Saturday? 42-47. Now when the evening was come, because it was the preparation, that is, the day before the sabbath, Joseph of Arimathea, a noble counsellor, who also waited for the kingdom of God, came, and went in boldly unto Pilate, and asked for the Body of Jesus. And Pilate wondered if He were already dead: and calling unto him the centurion, he asked him whether He had been any while dead. And when he knew it of the centurion, he gave the Body to Joseph. And he bought fine linen, and took Him down, and wrapped Him in the linen, and laid Him in a tomb which was hewn out of a rock, and rolled a stone unto the door of the tomb. And Mary Magdalene and Mary the mother of Joses beheld where He was laid. And let that soul be hewn from a rock, that is, from Christ Who is the Rock on which we are established. Let us wrap the Body of Jesus in the linen, that is, let us receive It within a pure body. For the body is the linen and the garment of the soul. We must receive the divine Body of the Lord not only with a pure soul, but with a pure body as well. And we must wrap It and enfold It within ourselves, and not leave It exposed. For this Mystery is something veiled and hidden, not something to be exposed. 16:1-8. And when the sabbath was past, Mary Magdalene, and Mary the mother of James, and Salome, had bought sweet spices, that they might come and anoint Him. And very early in the morning the first day of the week, they came unto the tomb at the rising of the sun. And they said among themselves, "Who shall roll away the stone for us from the door of the tomb?" And when they looked, they saw that the stone was rolled away: for it was very great. And entering into the tomb, they saw a young man sitting on the right side, clothed in a long white garment; and they were affrighted. And he saith unto them, "Be not affrighted: ye seek Jesus of Nazareth, Who was crucified: He is risen; He is not here: behold the place where they laid Him. But go your way, tell His disciples and Peter that He goeth before you into Galilee: there shall ye see Him, as He said unto you." And they went out quickly, and fled from the tomb; for they trembled and were amazed; neither said they any thing to any man; for they were afraid. The women had no understanding of Christs divinity while they sat by the tomb, and they bought myrrh with which to anoint His Body in accordance with the Jewish practice, so that It would remain fragrant and not begin to have the foul odor of decay. Myrrh also dries things out, and thus it absorbs the moisture of the body and preserves it from corruption. Thinking such thoughts as these, the women rose and came to the tomb "very early in the morning," or, as Matthew says, "after the sabbath," or, as Luke says, "at early dawn." [Mt. 28:1; Lk. 24:1] All four Evangelists say, "On the first of the sabbath" [mias Sabbaton], meaning, on the first day of the week (for "sabbath" was also the name they gave to the seven days of the week considered together, so that the "first day of the sabbath" meant Sunday). As the women approached the tomb, they talked among themselves about who would roll away the stone. While they were thinking about this, the angel rolled away the stone without their noticing. Matthew says that the angel rolled away the stone after the women had come to the tomb [Mt. 28:2] On this point Mark is silent, because Matthew had already said who rolled away the stone. Do not be troubled that Matthew says that the angel was sitting on the stone, while Mark says that after they entered the tomb, the women saw the angel sitting on the right side. It is likely that they first saw the angel sitting on the stone outside the tomb, as Matthew says, and that he then went before them into the tomb, where they saw him again. Some say that the women mentioned by Matthew were not the same ones mentioned here by Mark. Mary Magdalene, however, was with all of them, as she was fervent and aflame with zeal. The angel who appeared to the women said, "Be not affrighted". First he takes away their fear, and then he announces to them the good tidings of the Resurrection. He calls Jesus "the Crucified", for the angel was not ashamed of the Cross, which is the salvation of mankind and the beginning of good things. "He is risen." How do we know this? Because "He is not here". Do you want further assurance? "Behold the place where they laid Him." This is why the angel had moved away the stone, to show them the place. "But go your way, tell His disciples and Peter." He names Peter separately from the other disciples, as Peter was the foremost of the apostles. Also, because Peter had denied the Lord, the angel singles him out by name so that, when the women came and said that the Lord had commanded them to tell the disciples, Peter could not say, "I denied the Lord, and therefore I am no longer His disciple. He has rejected me and abhors me." The angel added the words "and Peter", so that Peter would not be tempted to think that Jesus found him unworthy of mention, and unworthy to be ranked among the Lords disciples, because of his denial. He sends them [out of Judea] into Galilee, delivering them from tumult and from their great fear of the Jews. 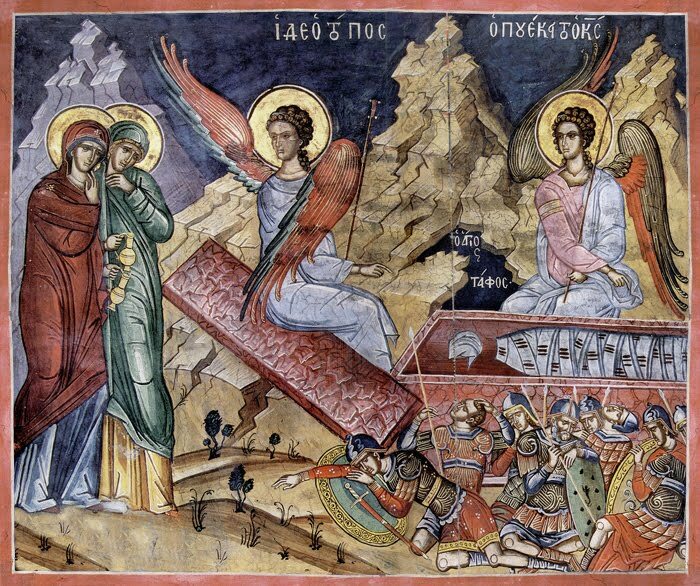 Fear and amazement had taken hold of the women at the sight of the angel and at the awesome mystery of the Resurrection, and because of this "neither said they any thing to any man; for they were afraid." Either they were afraid of the Jews, or they were so in awe of what they had seen that their minds were confounded. For this reason "neither said they any thing to any man", and they even forgot the command the angel had given them. 1. The Greek word for "tomb," mnemeion, is derived from the word mneme, which means "memory."